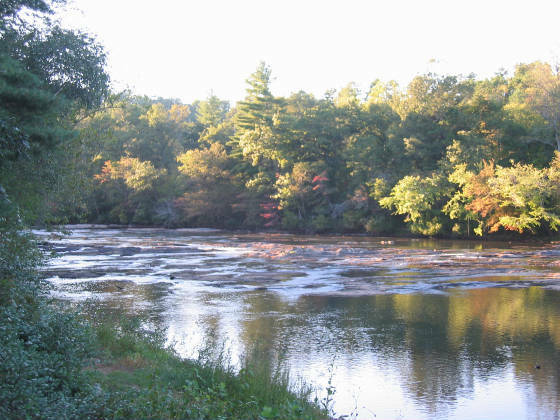 The Chattahoochee in the fall- Cherokee for " river of painted rock"
The male's prostate after the child bearing days are over provides no necessary function, much like an appendix. All it does is cause trouble for the aging male. It is something the male does not need, yet it continues to enlarge. The very part of the male anatomy he cannot see and does not need grows, while another part his anatomy that he would prefer to grow, not only doesn't but slowly loses the ability to function. 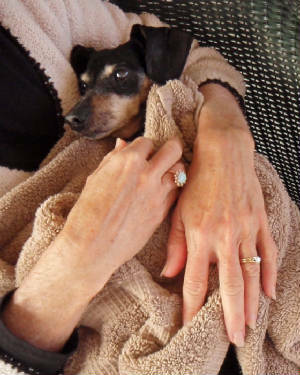 A significant event occurred about ten da ys ago......tootsie passed away. Tootsie was a small dog that was always hungry.Always hungry.She was the daughter of Oscar who mated our next door neighbor's Dachshund Penney. Our children went over to examine the litter and chose her because she was the "smallest one." She also was always getting into trouble. One time she went under the house at the lake and got trapped under the kitchen floor chasing a rat. We had to saw a hole in the flooring to get her out. On a another occasion she got into a fight with a Doberman Pinscher. The humongous dog lifted tootsie up and shook her and then just tossed her about twenty feet. Chloe had uncharacteristically started the fight by barking at the dog and making him mad. In the process bite ripped about twenty holes into her side and abdomen. Blood pouring and her lifeless, witnessing the whole thing. was one of the most dramatic and horrifying things I have ever seen. I had a rake that I was working with at the time, and I hit at the big dog until he left. I gathered up tootsie and Chloe in my truck with blood soaking my v-neck t-shirt and made my way to the vet's office , calling on the way. It was a Sunday I was listening to the Atlanta Falcons on the radio while I was working at the lake. The Vet met me there and I helped him sew up Puddlin Pie ( we had about sixty names for the pudster.) As it turned out she had no serious injuries. The bowel, a kiss of death had it been lacerated, is surrounded by fat and fat was weeping out of all the cuts but had protected the intestines. It was a two hour surgery, about a hundred stitches and she was back at home in about three days. The day she came home, I was holding her in my arms with my wife observing and decided to give her a little kiss on the nose. ( I had saved her life and loved her more than life itself, all of my family did.) Pueeet out of nowhere snaps at me and digs her teeth in my nose. Out of self defense I drop her to the floor. my nose bleeding with a deep cut. Pud goes running to my wife, who is now laughing at me as I go to the mirror to see how deep my injury is. Karen could not stop laughing. Such was Pud, her own woman and always hungry and eating the cat's food and scooting around the empty cat cans in the garage; acquiescing to no one. Over the last month of her life her hearing , sight and control of her bowels deteriorated to the point that it became a daily ritual for my wife to clean all of our walk ways with a water hose. The night before she died, I found her walking in circles in the front yard, a week before she rolled down a hill by our house and only by luck was discovered and rescued by Karen. We think she had a stroke because she was always tilting to the left when she walked with her ear down as if it had a weight in it. Two days before she died Karen, gave her a bath and rocked her on the porch for about two hours. We discussed what we should do. She did not seem to be in pain, it seemed too early to put her down, but she was not living a meaningful life; her appetite was good, we reasoned for leaving her be. Fifteen years, we'd loved her for fifteen years. I had gone to surgery early on a Tuesday morning, rainy and cold, and Karen called me to say, between tears, that she could not find Tuuet. We spoke about three times before noon, and then after that I decided I would not subject myself or Karen to her telling me that she had not found her. It was a cold and rainy day and the thought of a dog that we had had for fifteen years out in the cold alone and not well just killed us both. It was nauseating. When I got home that evening, at the door to our kitchen was a pair of soaking wet tennis shoes, an umbrella and a flash light. Karen had searched for Pud for six hours without success in ice cold rain. When I entered the house she had been crying all day during the search and her eye looked like she'd been in a fight. The picture above is when Pud had had a good bath, and Karen was rocking her on the porch a day and a half before she died. I was taking alot of pictures, we both sensed that the end was near.Karen told me later that evening that she had told Tootsie while rocking her, "Just die now, while I'm holding you." Now we were both crying and Oh how much better it would have been for the Puddson Pie to have died in Karen's loving arms. I still have a scar on my nose, it's O.K.